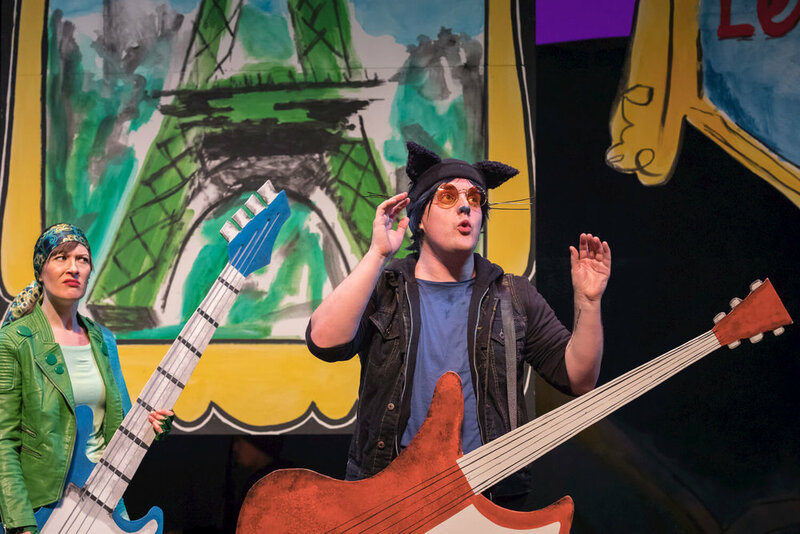 Rockin' rebel Pete the Cat clashes with total square Jimmy Biddle, until they learn to work together to conquer 2nd grade in this fun musical! When cool, smooth Pete the Cat moves in with the perfectly normal Biddle family, he rocks their world with his strumming and strutting. Everybody loves Pete, except for Jimmy, the world's most organized 2nd grader. But when Jimmy draws a blank in art class, Pete takes him on the inspirational road trip of a lifetime! The whole family will love Pete's hilarious, jazzy antics in this toe-tapping musical. Discounts available for groups of 8 or more! Click here for more info. OCT invites several illustrators and comic artists to sketch the show from the audience. Check out their work here! Pete the Cat: The Musical. Photo by Owen Carey.